Ocean Drive South Carolina is our specialty. Our team is committed to making the buying and selling of condos in Ocean Drive, SC a pleasurable and rewarding experience. Our website allows you to search all active Ocean Drive condominiums for sale. It is easy to use and navigate through condo searches. You can also save searches and get daily email alerts of new listings as they become available. Nowhere it the blend of the old and new that's a hallmark of North Myrtle Beach captured better than its Ocean Drive Beach section, home to the classic beach bars that were the birthplace of beach music and Shag dancing, the state dance of South Carolina. An area of some of the newest, most contemporary and luxurious high-rise condos, Ocean Drive condos for sale include the Avista Resort, the elegant MarVista Grande, and the Ashworth oceanfront resort. Ocean Drive Beach is also home to beach clubs with wooden floors and live music that fill with "Shaggers" most weekends. And twice each year, streets of Ocean Drive's "main street" fill with revelers as it turns into a giant dance party celebrating The Shag. 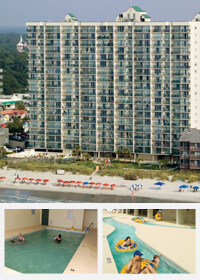 With a long list of amenities, Ocean Bay Club condos are available in 1, 2, 3 and 4-bedrooms in a prime North Myrtle Beach location. Ocean Bay Club features six outdoor pools, indoor pool, seasonal poolside bar and grill, putting green, exercise facility, Lazy River, playground, game room, exercise facility, golf department and more. Rooms feature large oceanfront balconies, master baths with Jacuzzi tubs, full kitchens, high speed Internet, and washer/dryer. 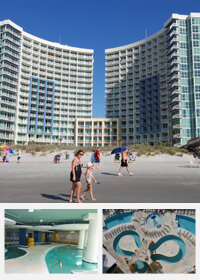 Offering upscale, contemporary 1, 2 and 3-bedroom accommodations in two beautiful and graceful curving towers, the Avista Resort in North Myrtle Beach features private balconies, top quality appliances in full kitchens, 24-hour security, designer furnishings, Wi-Fi and much more. A long list of amenities includes 3 swimming pools, hot tubs, fitness center, 2 Lazy Rivers as well as a seasonable poolside grill. Great food is available at the Just Off Main Restaurant and favorite beverages available at the resort's Tree Top Lounge. 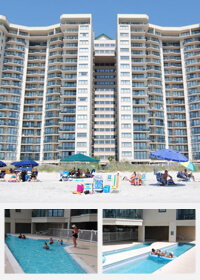 Amenities of the 2, 3 and 4-bedroom Ashworth condos include an oceanfront outdoor pool, a long 600-foot Lazy River, kiddie pool, Jacuzzi, indoor pool, fitness room, grill and picnic area. Within easy walking distance are shops and restaurants. This resort features include spacious floorplans, extra ride oceanfront balconies, Wi-Fi, garden and whirlpool tubs and a fully equipped kitchen. Close to many of the great golf courses for which the Grand Strand is world renowned, Ocean Drive is also convenient to the more than 100 shops, restaurants and entertainment venues found in Barefoot Landing. Buying a condo in Ocean Drive Beach means you'll be away from the crowds and clamor of Myrtle Beach but still have convenient access to all the great shopping, dining and attractions to be found there, plus all the many great attractions of North Myrtle Beach as well.